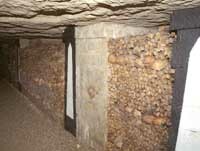 The Catacombs in Paris are an immense maze of tunnels dug under the city. 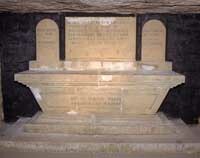 In 1786, all the bodies from Cimetiere des Innocents were exhumed and moved into the tunnels under Denfert Rochereau. Arrete! C'est ici L'Empire de la Morte - Stop! Here is the empire of the dead. 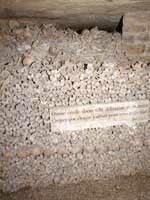 These walls, made out of leg bones and skulls, hold the remains. 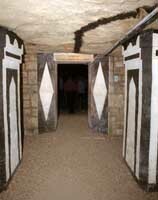 The other random bones were simply tossed in the box made with the leg bones and the tunnel walls. One crypt does the duty for all the souls here.